I asked him to save those six words someplace safe in his brain because that phrase was the epitome of effective communication from him to me in that scenario. Just months ago, that exact scenario would have played out differently. I’d have insisted we map it out on the whiteboard. Mike would humor me, but get frustrated or overwhelmed by the details. And a passive-aggressive exchange might even escalate into a brief bicker. But in this scenario, all I really want in the scenario is to nerd out about the schedule so I can proactively mitigate obstacles. Failing that, I just want to feel like that need is heard and understood. So his simple response really was perfect communication for me. We all have shortcuts that we use when communicating with people who we know well. Mike knows the difference in emotion when I breathe. My team and Mike know exactly what I mean when I ask them for “the thing” — with 95%+ accuracy, whether it’s a sweatshirt or a snack. 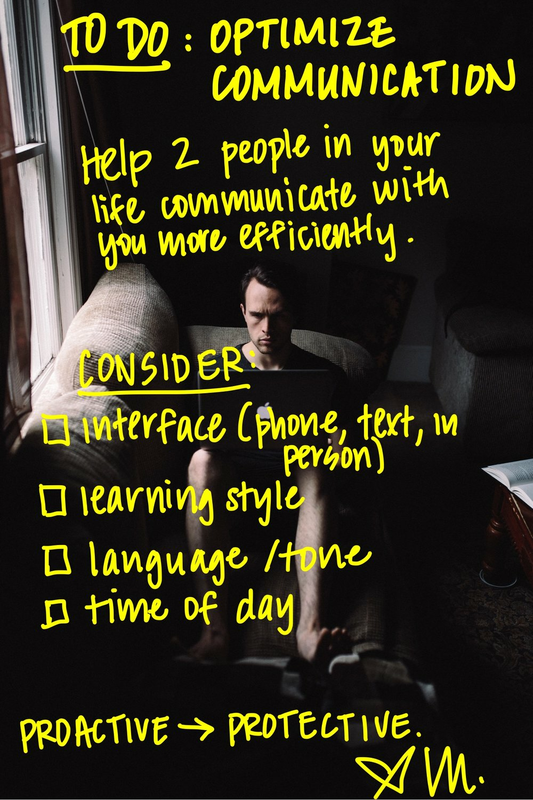 This week, proactively identify two people you communicate with most, and identify how you can optimize your communication with them. Do you prefer face-to-face meetings and video conferences, or emails and text messages, or audio or video memos? Do you prefer discussing business over a meal or outside the office, or only in a traditional office context? Are you an aural, tactile, visual or reading/writing learner? Prefer more positive reinforcement and constructive, strategic criticism? Or short and crisp? What time of day is best for you to do specific activities? When working off hours, do you prefer early mornings or late nights? Saturday vs. Sunday?